Garage Door Repair Amityville offers a wide variety of garage door openers to the people in Suffolk County. Whether you are looking for 24/7 emergency garage door repair, reasonably priced products, or reliable service, you can find all that and more with our local Amityville location. Not only do we help our customers in timely fashion, but also support them during emergencies with fast same day services, listen to their requests every time they want to replace the door, find the best opener solutions, and cover their repair needs efficaciously. Trust us every time you need professional services! The type of garage door opener we provide include chain drive, belt drive, and screw drive types. Each garage door needs a specific garage door opener to work properly, and Garage Door Repair Amityville can determine the best garage door opener for the job. 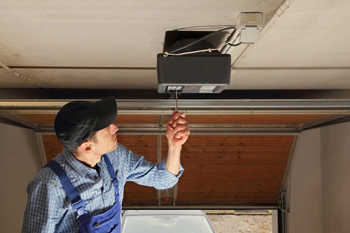 Chain Drive garage door opener models are built for long-lasting performance. Chain drive openers are reliable and rugged, utilizing brute strength to open the heaviest of carriage house or other custom wood garage doors. Belt Drive openers are ideal if there is an apartment or room positioned above the garage. These are among the smoothest and most reliable garage door opener systems a home can have. Belt drive models can be professionally installed with battery backup power that keeps the garage door opener in operation even when the power goes out. Screw Drive garage door openers are specifically designed to run in the most extreme climates. Amityville can face the coldest of winter snowstorms and these screw drive openers will still operate smoothly. They may make more noise than the other garage door opener types but they are also among the most affordable on the market. They can also be installed with a battery backup system so you will always have access to your home and garage. No matter which type of garage door opener customers choose, Garage Door Repair Amityville will allow you to choose the ideal garage door remote for your needs. Our professionals are experts in garage door installation and repair, so a job is never complete until the customer is completely satisfied. Please contact us for more information.